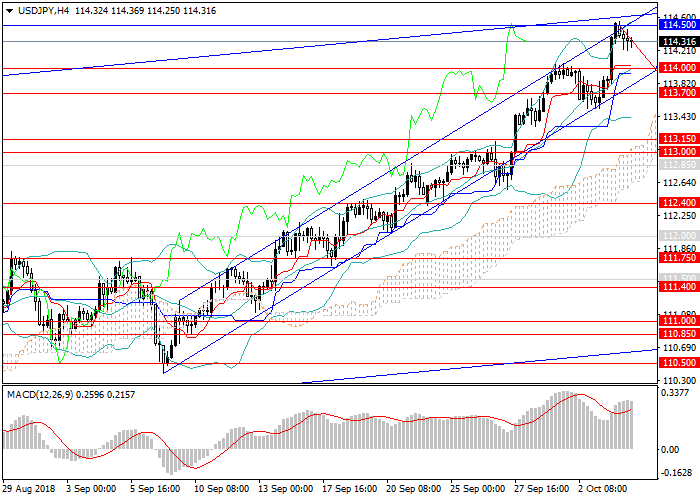 Over the last month, the USD/JPY pair gained more than 400 points and reached key resistance at the level of 114.50. The main catalyst for the movement of the instrument is the confident strengthening of the USD due to the background of strong fundamental statistics and growth in demand, as well as the weakening of JPY. Today, quiet sideways movement of the pair is expected before the publication on Friday’s key releases: US data on unemployment and Nonfarm Payrolls statistics. In the medium term, a downward correction to the levels of 113.15 and 113.00 is expected, after which an upward wave to new highs will be formed. However, in the case of the publication of strong statistics on the US labor market, the pair may sharply start to grow, breakout the key resistance level of 114.50 and reach the levels of 115.00, 115.50, 116.30 and 118.65. Technical indicators confirm the upward forecast: the volume of long positions of MACD increased significantly, Bollinger bands are directed upwards. Resistance levels: 114.50, 115.00, 115.50, 116.30, 117.00, 118.65. Support levels: 114.00, 113.70, 113.15, 113.00, 112.85, 112.40, 112.00, 111.75, 111.40. It is relevant to increase the volumes of long positions from the current level and from the levels of 114.00, 113.15, 113.00 with the target at 118.65 and stop loss at 112.60.